Our ward Christmas party was a nativity display. 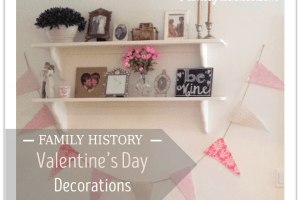 We decided to create a family history display in one of the rooms with Christmas family traditions and ideas from the FamilySearch Christmas campaign, 5 Ideas for Creating Cherished Memories this Christmas Season. The second idea on the list was to create ancestor photo ornaments, so I decorated a small Christmas tree with a bunch of photo ornaments. There are a lot of ways to make photo ornaments, from modge podging photos onto wood coasters to creating your own paper frame, but it doesn’t need to be complicated! Here are two easy ideas. 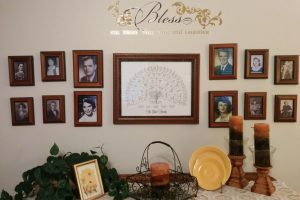 I have a family tree like this that I took some of the oval picture frames from. I just added some ribbon to the ring at the top and voila! I have an easy photo ornament. (this is an affiliate link. If you click the link and purchase the item, I receive a small commission). For the rectangle ornaments, I found some placeholder frames at the dollar store. After I put pictures in, I hot glued ribbon to the back. It was fun choosing pictures to add to my Christmas family tree! I chose some recent ones and some ancestors from long ago. One of my favorites is a picture of my husband and his siblings acting out the nativity scene when they were children. There are plenty of pre-made photo ornaments for sale at Target, JoAnns, and the dollar store. Right now is a great time to go pick them up for 80% off at the after Christmas sales for next year’s ancestor photo ornaments.